One of the quirkier ramen joints to open in 2016, Ginza's Kazami has made a name for itself on the back of a very unlikely ingredient: sake lees. Found in a narrow alley, it's very stylishly decorated and could pass for a high-end eatery if it wasn't for the exclusively noodle-focused menu. 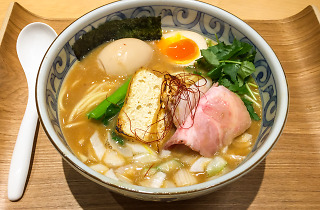 The speciality here is the Sake Kasu Noko Soba (¥980), a symphony of flavours built upon an additive-free soup made with chicken, pork, asari clams, oysters and high-end sake lees from Kyoto's Fushimi. 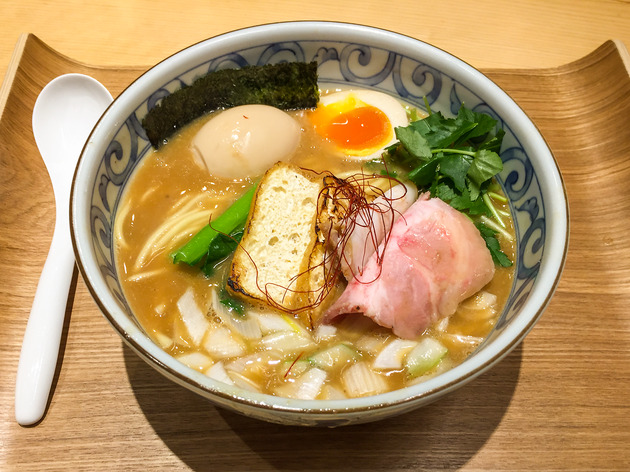 Add thin noodles – another Kyoto import – plus superb char siu, slightly grilled abura-age, leek, spinach and an egg, and you have an aromatic bowl unlike any other. For an extra kick, add some of the green chilli and ginger that comes with every order, or play with the yuzukosho and sansho seasonings offered at no extra cost. Kazami also does orthodox shoyu and shio ramen – both are excellent.